Cozy Studio close to the beach and many amenities! Book your Getaway today!!!!! 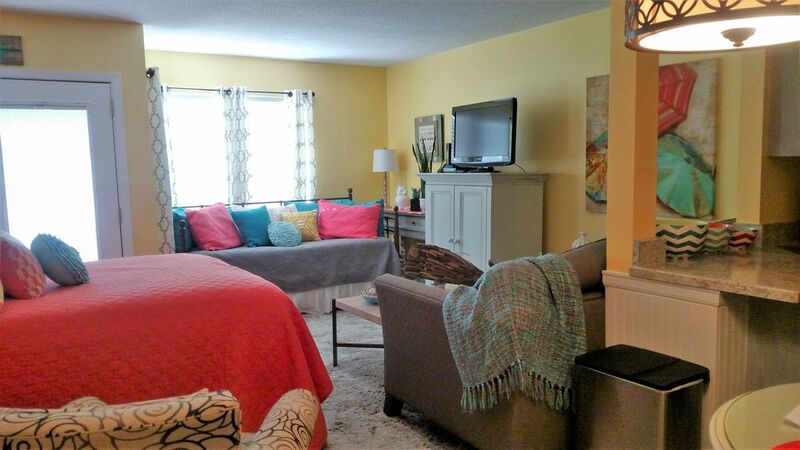 Guests are sure to enjoy a memorable vacation in this cozy furnished condo! It has a very comfortable queen bed and a trundle bed both with foam mattresses to give you a perfect nightly rest. All furniture are high end quality. The studio is kept in warm colors and a Florida theme so you feel very comfy and you actually don't want to leave anymore! The kitchen is perfect for cooking as it is equipped with all the necessary items you need to cook the perfect meal or just to prepare a small snack. This studio is one of the rare ones to have its own washer and dryer in it. Situated close to the entrance/exit gate you just go over the street and you are at the gate to the private beach of Sandpiper Cove where you can enjoy the white sand and the crystal clear water of the Emerald Coast! Sandpiper Cove in Destin has something for everyone! This gated property features 1100 feet of pristine private beach frontage with a beach pavilion, seasonal snack bar and beach service. On-site amenities on the inland side include an excellent harbor front restaurant (The very popular Louisiana Lagniappe which has recently undergone extensive renovations and expanded their outdoor dining capacity), private marina, private boat launch, and boat docking along the canal by reservation. Other amenities include six tennis courts (three of them are lighted), five swimming pools (two of them are heated), and three hot spas. A favorite with everyone is the par three nine-hole pitch and putt golf course which runs throughout the entire northernmost acreage of Sandpiper Cove, shuffle board and horse shoes. Twenty four hour staffed gate house entrance and roving courtesy patrols complete this unique amenity package. A key factor at Sandpiper Cove is LOCATION, LOCATION, LOCATION! Nestled in the heart of downtown Destin, it is bordered by the by the Gulf of Mexico to the south and the Destin Harbor to the West. It is within walking distance to several shopping areas with boutiques, restaurants, hair and nail salons, as well as grocery stores: and within a very short drive to numerous area attractions including: The Destin Fishing Fleet, several top notch golf courses, Silver Shells Outlet Mall, The Village at Baytowne Wharf. Spend the day away, enjoying nearby attractions such as the Big Kahuna's Water park , take a walk at the Harborwalk Villiage on the Destin Harbor which is all very close to Sandpiper Cove or go deep sea fishing, skydiving, sailing, take a cruise, go dolphin watching or explore the scenic panhandle of Florida! Just come and relax or have an exciting time in our condo at Sandpiper Cove in Destin!!! Age requirement is 25 years. This is due to the association laws!!!!! My name is Kirsten, I enjoy managing my own condos and hope you will enjoy staying there. I always like to hear suggestions for improvement or changes that would be of benefit to my guests!!! The Location and setting is perfect! I fell in love 2 years ago when we visited Sandpiper Cove for the first time!!!! It is the well maintained neighborhood with its 24 hour security. We love the fact that it is not only one minute to it's private beach. Another plus is that it is in the immediate vicinity of many fabulous restaurants! All together Sandpiper Cove, Destin Florida is the place to be!!!!! When I saw the way the condo was decorated that made me decide to buy it just from the pictures. I never saw it until the day I closed. I surely was not disappointed !!!!!!!! The washing machine is small so only a few towels have space. Towels need to be free of sand!!!!! Some books for you to read and if you want to leave one please feel free to do so!!! Thanks in advance!!!! Sandpiper Cove has a par three nine hole pitch and putt golf course, which runs throughout the entire northern portion of Sandpiper Cove. This little condo was perfect for my honeymoon! Awesome location, close to the beach, had everything we needed. 10/10 recommend!! Very cozy and relaxing! Everything we needed to enjoy the beach. This studio exceeded my expectations and I appreciated all of the extra comforts, especially all of the beach gear! Very comfortable, safe, quiet, and a great place for my teenage grandchildren to relax and have a great time. The owner was very kind and accommodating. Thank you.